The gospel readings on Sundays have lately been featuring Christ confronting the scribes, Pharisees, and other groups of religious authorities who have had an issue with Jesus. After all, the religious authorities realized that Jesus was not like the others and they did their very best to take Him down! Otherwise, they might lose the power that they held on the people. Yet, no matter what they tried to throw at Him, He always had a better reply. What can I say? God has the perfect comebacks! But this wasn’t the first time that Jesus confounded them! The first time happened when He was a mere twelve years old! When we pray the Joyful Mysteries of the Rosary, we often call this “The Finding of Christ in the Temple.” After all, the Rosary centers on Mary’s perspective and reveals Christ to us in that way. And, in Mary’s perspective, she lost her son! And then found Him and made Him come home and He obeyed until finally she let him loose at the Marriage of Cana. However, in art, the scene is often called, “Christ Among Doctors.” There, the images often focus on Jesus, interacting with the Temple authorities. If Mary and Joseph and appear in the picture (and they don’t necessarily show up!) usually they are in the background or just at the edge of the picture. 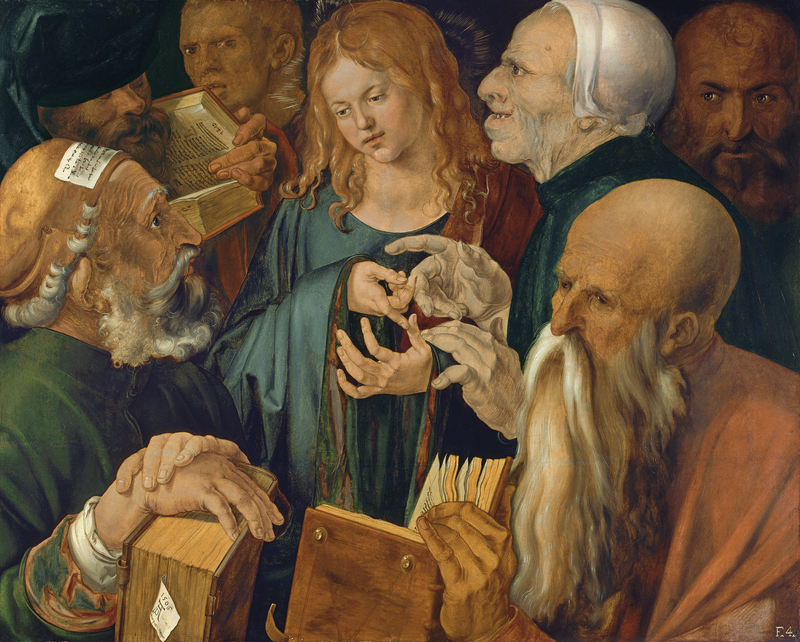 Jesus Among the Doctors, by Albrecht Dürer, C. 1506. Museo Thyssen-Bornemisza, Madrid, Spain. Christ is at the forefront of the picture, with Temple authorities surround Him. And each one has a different expression on his face when encountering the young Christ. One is listening to him with a devout and interested look on his face. Another looks away from him with a reflective and possibly sad expression. One is too busy looking at a book to really notice Christ and almost seems to be ignoring Jesus entirely. Another has a look of anger and disgust on his face. One person right close to Him has an incomprehensible face — I’m still not sure whether he is glad that Jesus is with him, or trying to manipulate him in some way, though honestly it could be a bit of both. And yet another face in the background looks downright jealous. When Jesus was an adult, the Temple authorities had much the same reactions to Jesus’ words. Some, such as Nicodemus, listened to Him, some were angry and disgusted with him, others tried to ignore him, still other others were downright jealous and would have done anything in their power to kill Him. And, in a way, we can react to Jesus in very similar ways at different parts of our lives. Think about it honestly: what sort of relationship do you have with Jesus right now? Most likely, it’s one of the reactions that these Temple authorities had with Jesus. In fact, it could be a combination of these reactions! What can I say? Even the best of us have a little inner Pharisee buried deep down in them, especially when Christ confronts us. And that’s one of the things that makes this artwork so great. I’ve studied at this picture for more than a year now — in fact, it was one of the first artworks that I picked for my book, The Joyful Mysteries — and still I’m not sure exactly what I think about it. It’s incredibly complex and nuanced and seems to change as I change, honestly. But, in a way, that’s what I love about religious art — how the greatest artworks challenge your ideas about faith and make you realize how desperately you need Jesus. And let’s face: we all need Jesus. May we approach You with love. Let us listen to Your words and follow You, for it is through following You that we may live out our friendship toward You. Interested in more artwork of the Joyful Mysteries of the Rosary? Check out my new book!